My first day on the NOAA Ship Oregon II! Having spent a few days on the ship now, I’ve come to realize that NOAA Ship Oregon II is a lot like the Millennium Falcon from Star Wars. In Star Wars Episode IV: A New Hope, Han describes the Falcon by saying, “She may not look like much, but she’s got it where it counts, kid. I’ve made a lot of special modifications myself.” Every crew member and scientist that I’ve talked to talks about Oregon II like Han does about the Falcon. 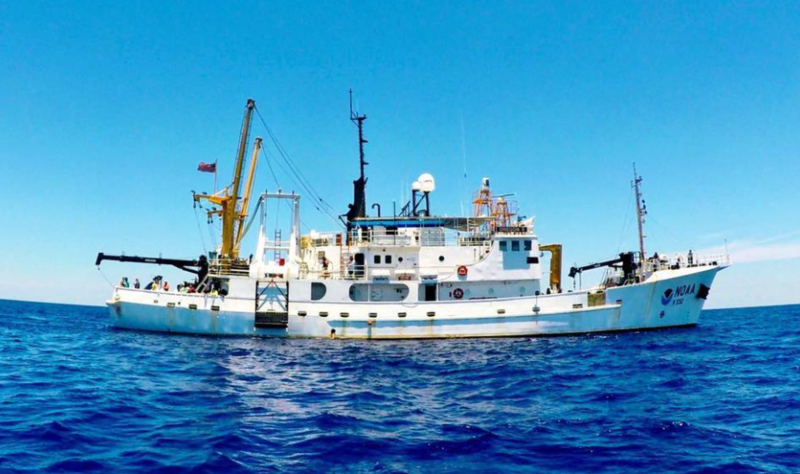 The typical conversation starts with them saying that she “may not look like much,” being the oldest and one of the smallest research vessels in the NOAA fleet. But without fail, they immediately begin talking about how versatile the boat is, thanks to the many modifications that have been made over the years (some even joke about how the boat itself may be 50 years old, but none of its parts are). 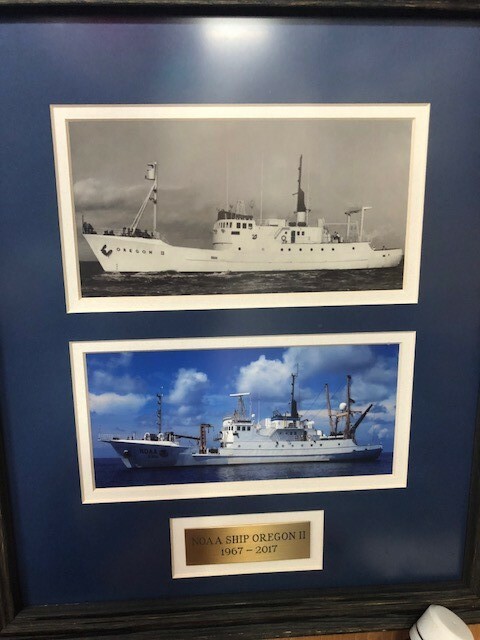 The boat is covered with its many awards and achievements, and has the lowest crew turnover in the NOAA fleet (many of the crew members have worked on the ship for over 20 years!). You can see how much the ship has changed in its 50 years! On Thursday, we began our two-day “steam” from the NOAA Ship Oregon II’s home port in Pascagoula, Mississippi, to Brownsville, Texas (near the border between the US and Mexico). Upon reaching Brownsville we’ll drop our first trawling nets at various stations, which are randomized locations where we’ll make our measurements. The data we collect is part of the SEAMAP Summer Groundfish Survey, which the Gulf states of Texas, Louisiana, Mississippi, Alabama, and Florida depend on to assess the health and vitality of groundfish in the Gulf of Mexico. For example, according to the Texas Parks and Wildlife (TPWD), the commercial shrimp season for both the state and federal waters “is based on an evaluation of the biological, social and economic impact to maximize the benefits to the industry and the public.” Knowing that I helped with the “biological evaluation” they refer to makes the work feel important. 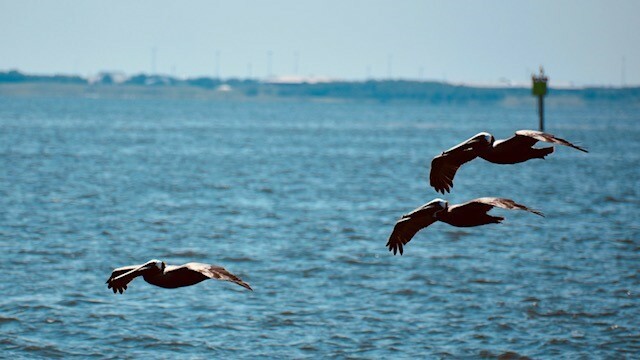 Casting off from Pascagoula felt like getting a “best of” tour of the Mississippi Gulf. 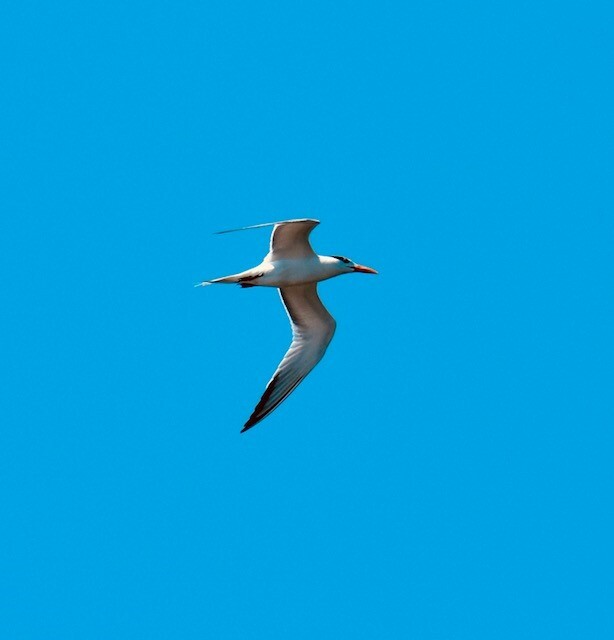 The first hour of sailing was filled with incredible views of wildlife: groups of pelicans buzzing the ship, terns hovering above the deck, and flocks of seabirds chasing after fishing ships hoping to catch a meal. Every few hours we also see pods of bottlenose dolphins playing in the boat’s wake, and schools of flying fish gliding alongside the boat. The diversity and abundance of life reminded me that the Gulf of Mexico is a fertile ecosystem, with so much to explore. 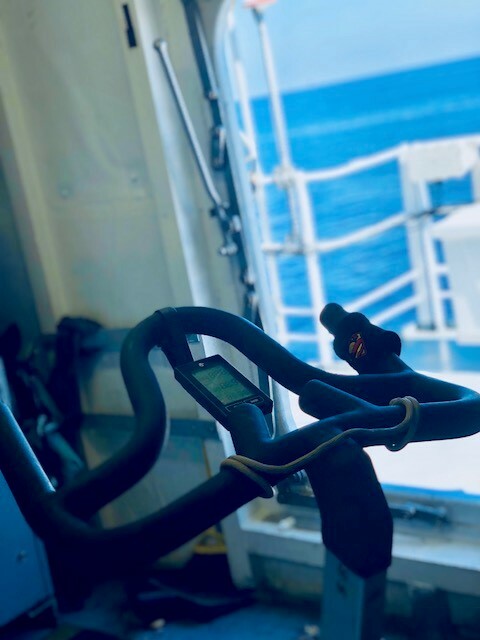 Without stations to take measurements, I don’t have many responsibilities yet on the ship, so I spend most of my time getting to know the crew, reading, watching the ocean, and working out. I was worried about what two weeks at sea would do to my triathlon training (it’s the middle of racing season! ), but luckily I found a stationary bike with an incredible view. 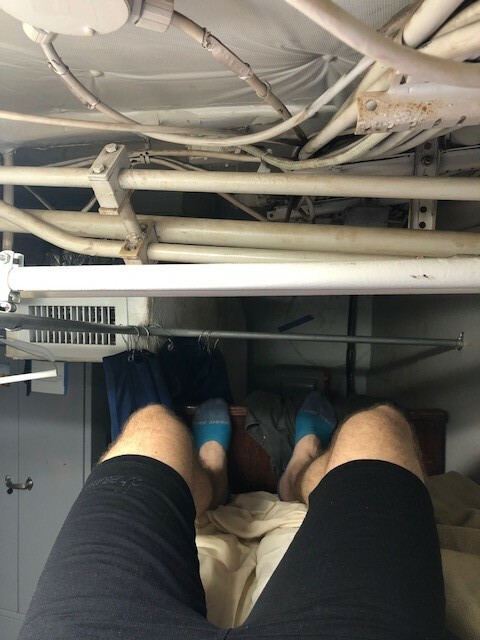 The term “stationary” bike feels almost tongue-in-cheek though, as the boat’s rocking and rolling have caused me to tip over more than once. On the bright side, I’m getting more of an ab workout? The boat is also constantly moving and humming. You learn quickly that you can’t move too quickly because of the large waves rocking the boat. While the gentle rocking of the ship can help lull you to sleep, every hour or so the waves get so rough that things start falling off of tables, which makes dinner time… fun? One thing is for sure: the sunsets on the Gulf are unparalleled. The sunsets on the Gulf are unparalleled. British composer Ralph Vaughan Williams set text about the sea from American Poet Walt Whitman’s “Leaves of Grass” in his Symphony No. 1, “A Sea Symphony,” for chorus and orchestra. In the piece, Vaughan Williams paints a symphonic picture of the sea that transports the listener, making you feel as if you were at sea. Since setting sail a few days ago, I can’t get this piece out of my head. Have a listen! Hello! 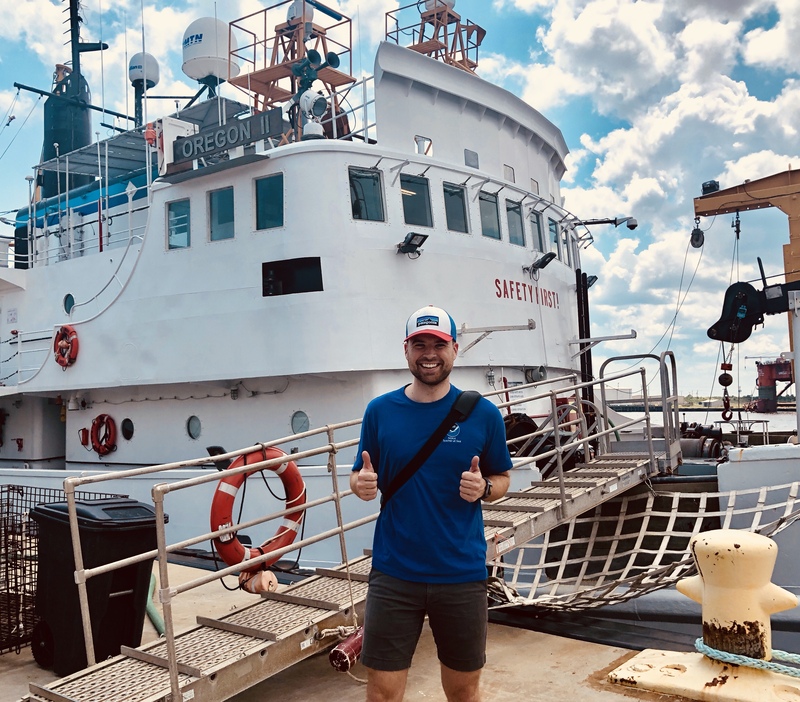 My name is Geoff Carlisle, and I’m joining the NOAA Ship Oregon II this summer as part of the NOAA Teacher At Sea program. 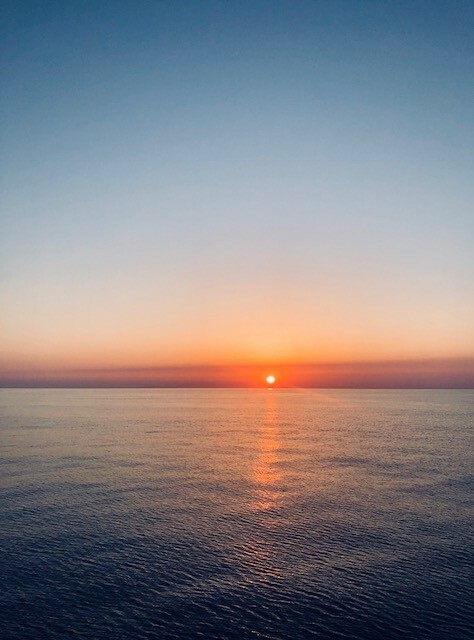 Every few days I’ll be posting updates here about my experiences on the ship, so keep checking in for updates from the Gulf (and to see if I’ve fallen overboard)! I’m so excited to fly to Pascagoula, Mississippi tomorrow to begin my trip. When I heard that I was selected to join this program, I felt like a kid again. For anyone who knows me, I wear my love of nature documentaries and the natural world on my sleeves, so the chance to live at sea and interact with sea creatures is a dream come true. My biggest hope for this trip is that I get to hold a shark (crossing my fingers)! I have to admit, the idea of sailing in the Gulf of Mexico gives me as much trepidation as it does excitement. As a science teacher, the Gulf is synonymous with hurricanes. 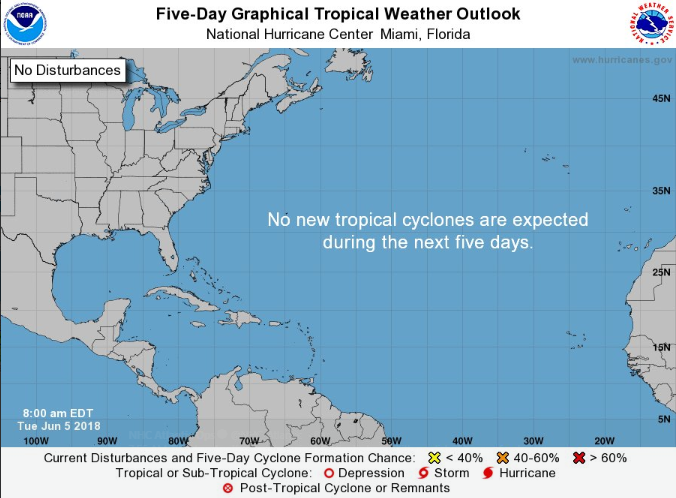 However, I was pleased to see that NOAA’s National Hurricane Center tweeted today, “no new tropical cyclones are expected during the next five days.” So I’ll be fine for at least that long. Here in Austin, the heat is oppressive, with temperatures already reaching over 100 oF, and daily reminders from NPR that we are flirting with record highs. Daily life is consumed by heat-related questions: “Did I put the sun reflector up in my car so can actually sit in my car? Did I bring another shirt with me for when I inevitably sweat through the one I have on? Are people like me with Norwegian heritage even supposed to live this far south?” As a triathlete, I spend a lot of time training in conditions that mimic what I’ll see in a race. Since the direct sunlight and heat will be similarly intense at sea, I’m just treating each triple-digit day like a training session. A very sweaty training session. 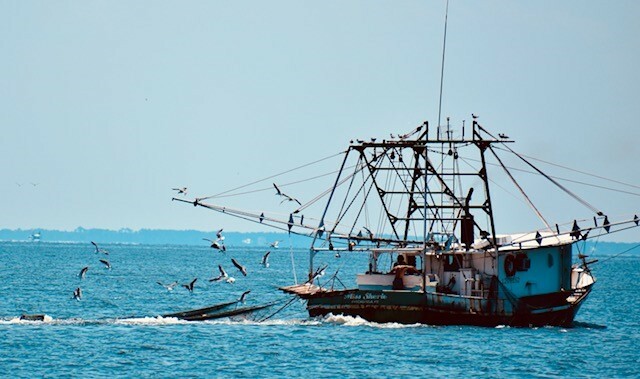 Four ships across the Gulf, including the Oregon II (see below), conduct this research in June and July every year by casting long nets called trawl nets at different locations around the Gulf. These nets are reeled onto the ship’s deck, and the contents of the catch are brought inside to be sorted by species, sexed, measured, weighed, and the data recorded. Some particular species will be stored and brought back to labs on the mainland for research. 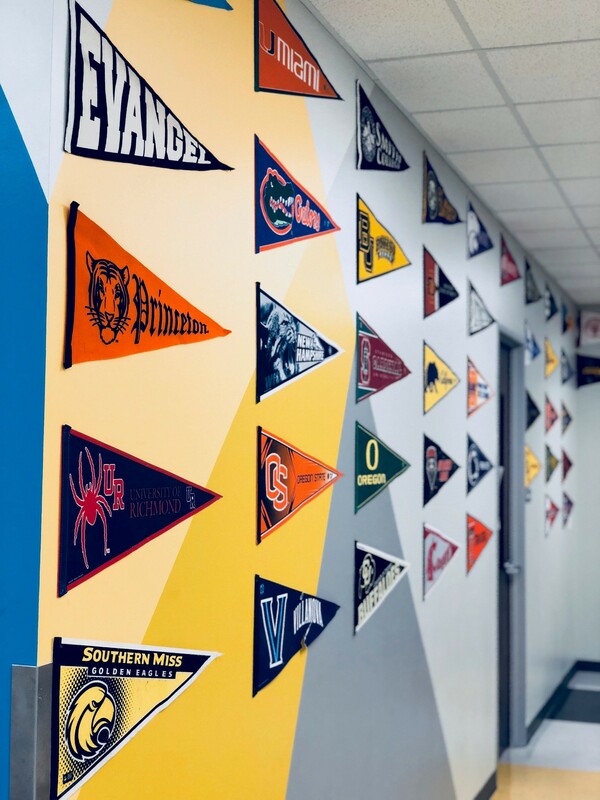 College pennants decorate the walls when you enter the school, giving a visual reminder to our school’s driving purpose. Last week I completed my 8th year teaching middle school science. I began my teaching career as a Teach For America corps member in the Mississippi Delta, and have spent the past six years at KIPP Austin College Prep. 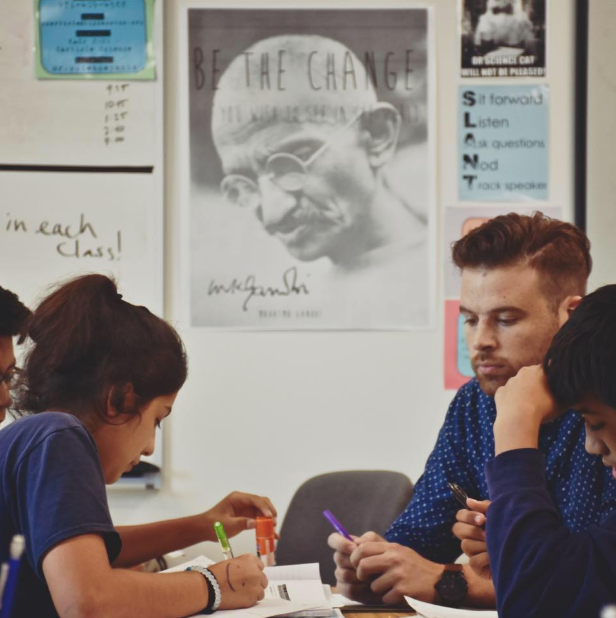 KIPP is a national network of public charter schools that primarily serve students from underserved communities, and put them on the path to college. Every day when I enter school, the first thing I see when I come in the door is a sign that says “Home of the hardest working students in Austin,” and this couldn’t be more true. I came to KIPP because I wanted to be a part of a community of exceptional educators who are committed to educational equity. Being part of a mission-oriented organization makes every day feel urgent and purposeful, and I’m proud to call myself a KIPP teacher. Watch the video to learn more about KIPP Austin! As a science teacher, I know how important it is that my students have learning experiences outside of the classroom. 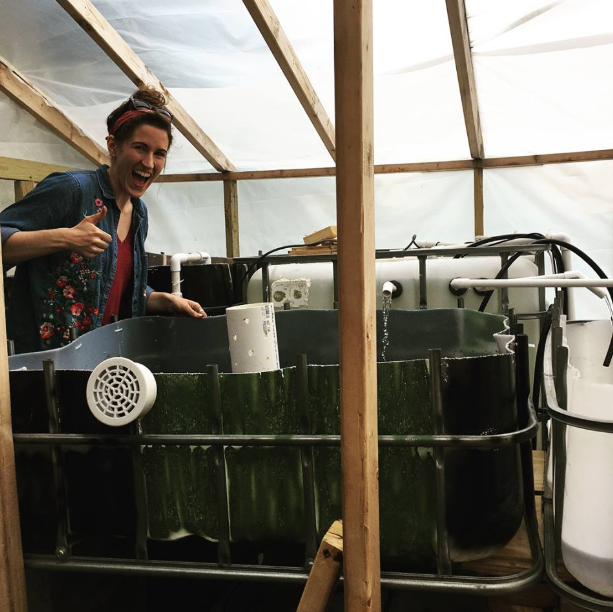 Partnering with my immensely talented colleague Colleen Henegan, we secured a Bright Green Futures grant from the City of Austin to build the largest school-based aquaponics greenhouse in Central Texas. 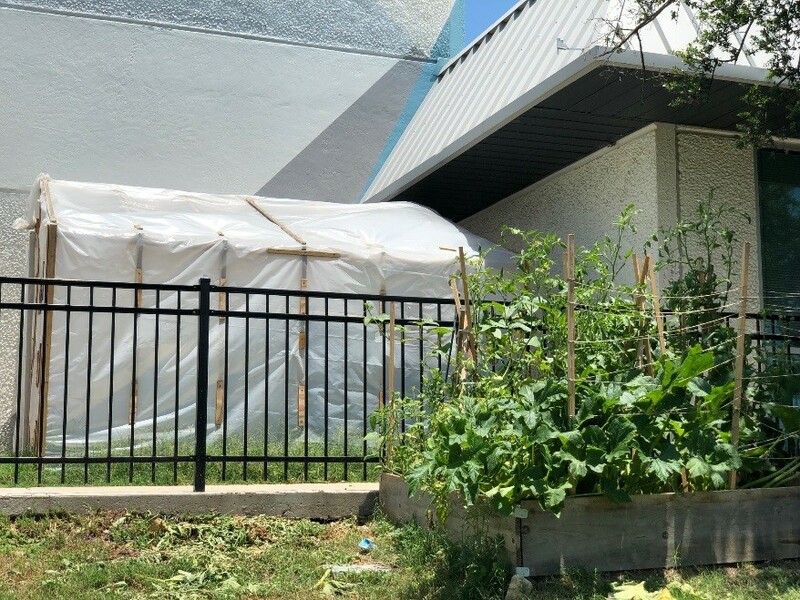 Our school is located in a federally-recognized food desert (an area where access to healthy foods is severely limited). The system was built largely by our own students, along with Google employees who volunteered their time. 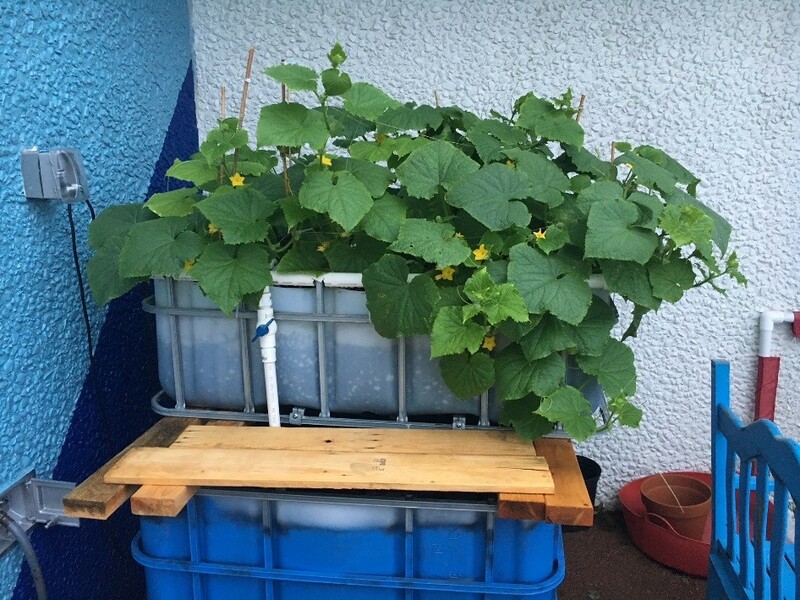 Aquaponics is a method of cultivating fish and plants together in a closed system that is vastly more energy-efficient and requires 90% less water than traditional agricultural methods. Our students are learning how to grow plants in an environmentally-conscious way that allows them to see how science can be used to solve real-world problems. Outside of teaching, I enjoy playing in an orchestra and training for triathlons (I’m training for my first Ironman 70.3 in October! ).